Today in Ottawa there will be a memorial service for Elsie Howard, a woman who touched our lives deeply. Linda wrote this tribute for Elsie–who would have been 99 on February 24th. Elsie Howard quietly and gently loved us. Elsie became a grandmother to three children who lived far from their grandparents. As the Scriptures promise when we leave our “father, mother, sisters, brothers for Jesus sake, Elsie, among others, became our grandmothers and mothers. Elsie, who’d worked as a dietician, had a culinary flair for food that was healthy and adventurous. She loved trying new recipes – and new Thai dishes. Lunches out included nutrition tips and best bargains. She shared with me that she always sought to prepare a healthy, balanced meal. Perhaps that’s one secret to her longevity. The other secret was her attitude. Often laughing, she looked for the positive: Our kids were special, all the pastors were wonderful, and the places she lived a blessing. It was at Elsie’s 90th birthday party that she shared the true secret of her success: she’d memorized the Love Chapter (I Cor. 13), and had spent her life trying to live it out. It had reaped a guest list of 30 people, and she only wished she could include everyone! 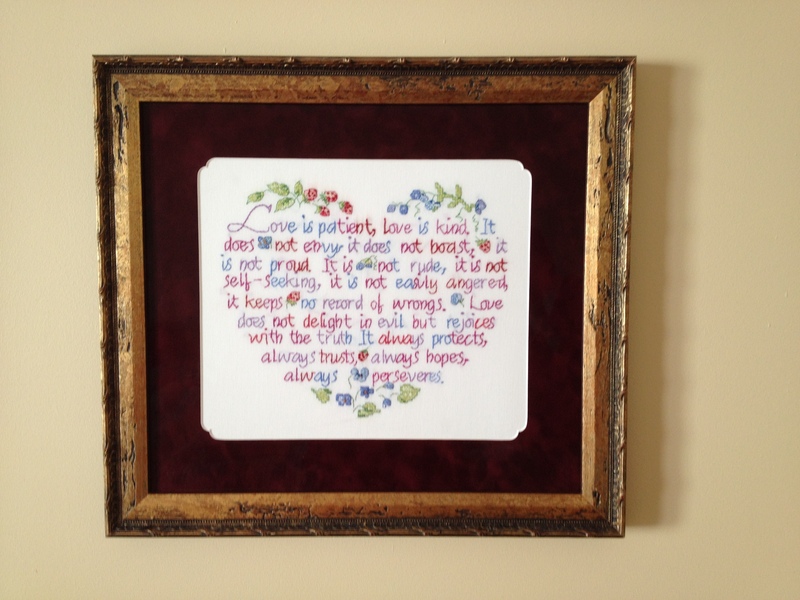 And so it was that I purchased an embroidery kit with the words of I Corinthians 13, and began to slowly stitch, seeking to let those words live out Elsie’s legacy in me. I only finished last summer. Realizing how impossible it was to be perfect, I framed it with old rugged wood to remind of the cross of Jesus who loved perfectly, even to death on the cross. This now hangs at the foot of our bed, so that nearly every day I think of Elsie. Do we meet great people in our time? Yes, and Elsie was one of them. Born prematurely at 2 pounds nearly 100 years ago, her life was spent fighting life’s odds with love. She loved the church, she loved the pastors, and she loved her Saviour. She gave her life to Him again last Sunday morning. .
Elsie left a legacy for all of us, a reminder that the greatest of these is Love.